I still remember how excited we were when we made our own pasta for the first time about two years ago. The process itself is surprisingly simple, but it requires a whole lot of time – you need a free afternoon – and strong underarms (which you will inevitably develop after making fresh pasta a couple times!). But working the dough with your hands is fun and in the end you get rewarded with delicious fresh pasta. 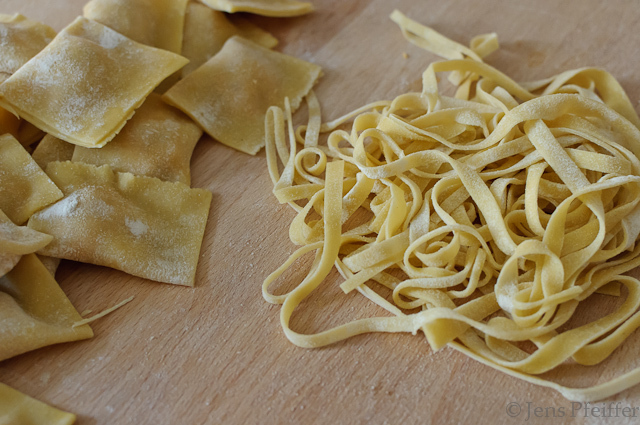 And we are always impressed by how much tastier homemade pasta is compared to the dried variety. In order to make all the time and effort worth it, we almost always make more than we need and freeze the extra portions for another time. Note: You can use a normal rolling pin for this recipe. 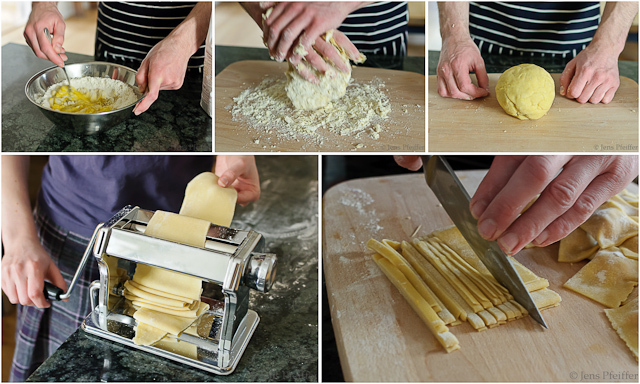 But if you plan to make fresh pasta more often, it’s worth investing in a pasta machine. These little tools are not very expensive and make it much easier to roll out the dough in a thin layer. Put all ingredients in a large bowl and mix thoroughly. Kneed until the dough is smooth. Form dough into a ball, cover it with cling wrap and let it rest in the fridge for about 30 min. Now comes the tricky part: rolling out the dough. It’s much easier if you separate the dough into three or four smaller portions and work in rounds. If you work with a pasta machine, start with the widest setting. If you use a rolling pin simply flatten the dough and roll it out on a large working surface. You’ll notice that during the first rolling, the edges of the dough will crack. To avoid this, fold in the edges and roll again. From time to time dust with some flour to avoid the dough sticking to itsself. Gradually reduce the gap of the pasta machine until you reach the smallest setting. If you use a rolling pin, try to get the dough as thin as possible. Cover the finished dough with plastic wrap (it dries out otherwise) and continue with the other portions. Once all the dough is rolled out into thin sheets, you can decide what kind of pasta shape you want to make. Try, for example, making your own tagliatelle. To do this, fold the sheets two or three times and cut small strips with a large kitchen knife (see above). Loosen the strips with your fingers to separate any sticking pasta. If you want to try them right away, bring some salted water to a boil. The tagliatelle will be done in about 2-4 min. Enjoy with your favorite pasta sauce! Another thing you can do is to make your own home-made ravioli. We will soon be posting a recipe with a sweet potato and goat cheese filling – stay tuned! Yummy! My girlfriend just bought a pasta machine so I’ll be making some of my own soon. It looks awfully therapeutic – fantastic. Yum! I love your photos and I’m looking forward to that ravioli filling! looking forward to making this! thanks for the great photos.